Ivory Coast and Japan go head-to-head in their World Cup 2014 Group C match on Saturday, June 14. Kick-off time is 9:00 p.m. EDT at Arena Pernambuco in Recife. Here is a preview of the match. RECIFE, Brazil (AP) — It’s a contest of brawn and bravado against pace and finesse. The muscular Ivory Coast team could not be more different at first glance from the compact Blue Samurai of Japan. One thing the two teams meeting in Saturday’s opening Group C match have in common: crowd-pleasing flair that translates into goals. Neither are footballing giants but both contain their share of genuine stars: Manchester City’s Yaya Toure and former Chelsea legend Didier Drogba for Ivory Coast, AC Milan’s Keisuke Honda and Manchester United’s Shinji Kagawa for Japan. Ivory Coast have age going against them: Toure is 31, Drogba 36 and defender Didier Zokora is 33 , making them old men in footballing terms. Toure is coming off a grueling league campaign with Manchester City, where he won the Premier League, and suffered a hamstring injury in the last match of the season. Japan is younger and possesses boundless reserves of energy but has shown baffling spells of inconsistency. They have honed a dangerous attack under Italian coach Alberto Zaccheroni yet succumb to sudden defensive lapses — something for which the Africans will surely look to punish them. Zaccheroni acknowledges that Japan needs to work on its “concentration” — but insists that letting in goals is the price to be paid for a football style geared at scoring them. “If you score three goals against Belgium you must be prepared to give up a couple,” Zaccheroni said, referring to a thrilling November friendly in which Japan edged a strong Belgian side 3-2 on opponent turf. The two teams are widely seen as being on equal footing. And the group itself, which also includes Greece and Colombia, has no clear favorites to get through to the knockout stages. Japan will be hoping that their top stars Honda and Kagawa, who both had disappointing league seasons, will find their form in the World Cup. They are an imaginative duo who are a threat any opponent when at the top of their game. Honda said Japan have what it takes to go far. Ivory Coast will be hoping that Toure, the heart of their team, will be match fit. “Wait until Saturday, June 14 to see if Yaya will play,” said Lamouchi. Another key will be whether Drogba, a declining superstar who now plays for Galatasaray in Turkey, can find one last spurt of genius in the world’s greatest tournament. This will not be a glamour match but football fans may be advised to tune in. 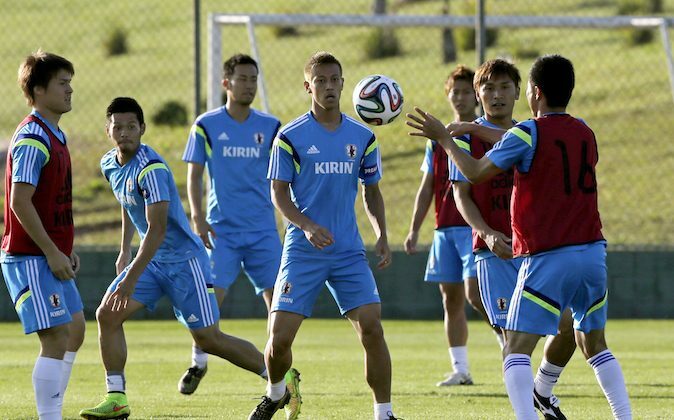 With their pulsating football styles, Japan and Ivory Coast will be ready to put on quite a show.